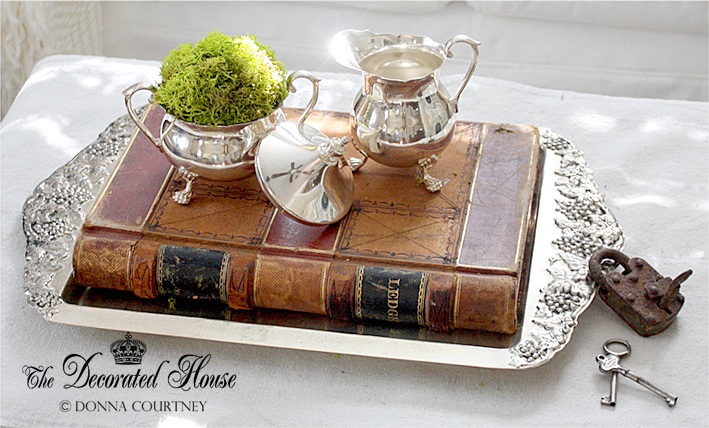 This post started out about simple vintage silver and old books with a dash of moss. I love this combination of elements, shiny, heavy texture, garden green, aged silver, all on a more rustic piece of unbleached cotton with its lovely woven texture. However the evolution of the ottoman - coffee table is another fun project, too. would be making an appearance in the living room. I liked the size of the chest and I still didn't have anything to use for a coffee table in this space, and it was needed. The silver leaf white coffee table that I showed here came a bit later, and I change them back and forth with the mood of the day. So I didn't have much to lose if I tried to make something new out of it. After giving it a little thought as to what I really needed, the answer was the same as any other time, we need anyway to get more storage. 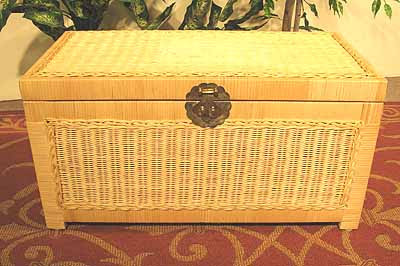 And the chest is a good size to hold about a room's full of Christmas Decorations or pillow cover and throws. So I made a cover for it and use it as an ottoman. The cover comes off for easy cleaning. Since the main cover is white, I also made an off white cotton runner for the top out of the same fabric as some of the pillows and it can be washed more often if needed. Perfect place to show a few found treasures, a plant or sit a drink or a book you're reading. And it will certainly do for now, or for a while. In the first picture you can see a little bit of the French chair which has a new seat. The tutorial for how to upholster a simple chair like a side chair or dining chair is HERE. On the sofa is the "5 Minute Pillow" done in the same fun blue design. You can find the tutorial for making a 5 Minute (or 10) Envelope Style Pillow HERE. I don't think the silver is too old, but I have seen the same pieces being sold as "vinatge" which could mean they are at least not too new either. One day the chest/truck might well end up back on the porch. Although it was considered a very temporary solution, it has worked out well all around. The storage is dearly needed though! Thanks Marty & Kathy for stopping by. That looks really great. You did a beautiful job. Fabric is the same as paint sometimes--it can change things so dramatically. I love this and thanks for the reminder about fabrics! I love textiles anyway! Great job. The top is not padded, but it does have the "padding" of the extra layers of fabric. And storage is a big plus as you all said. Fabric is even better than paint sometimes for a change in the decor or look of a room. That's why I often use a natural background so it can be updated with just a bit of fabric. That looks really great--such a great idea! Would you come over and help me do some changing around? 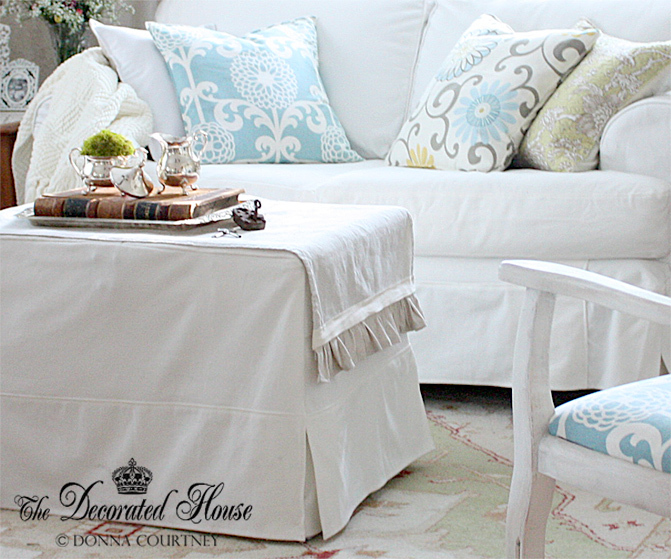 :-) This is a perfect ottoman and the fabrics are wonderful! Oh I agree what a beautiful job. Everything looks so pretty and I love that pop of color from the moss. Hi Donna What a great "green" project. Doesn't it feel great to make over something you already have and have it turn out great and be just what you wanted? You'd be amazed what you can use to cover things with. Your new ottoman looks very chic. How smart of you. I wanted a new slipcover for a couch we have that I really don't like in too many ways but no money. So I went trolling in an old trunk in my sewing room and voila found a matelasse bedspread, was just what I wanted for a while anyway til I get a yen for something else. It's a nice light green color so will be cool and casual in our living room. Our coffee table is a wicker outdoor table with a glass top and wicker shelf underneath, perfect size for our small l/r. Your blog is very inspirational. Donna what a hidden treasure to the best outcome for storage. Loving all that you inspired. 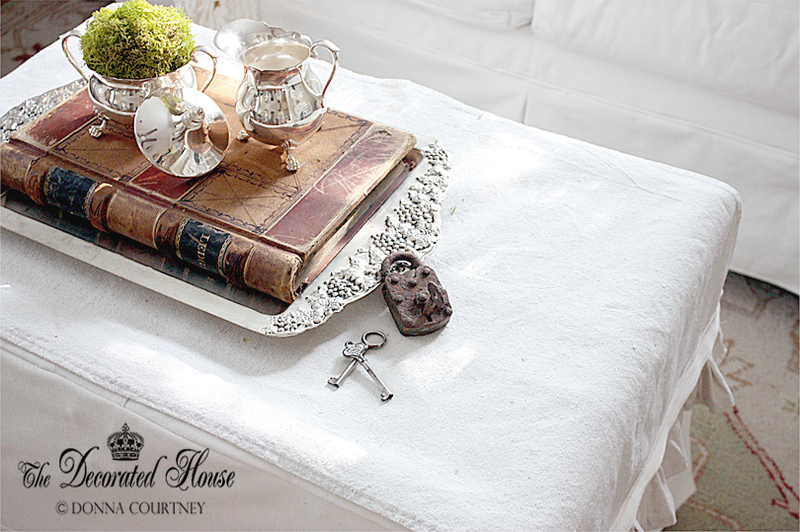 The tray with the leather book fits perfect and I love that it is the same size as the tray, I am inspired here! Thank you for your beautiful visit to my place and encouraging my art in painting. It is going to be fun getting to know you much better. 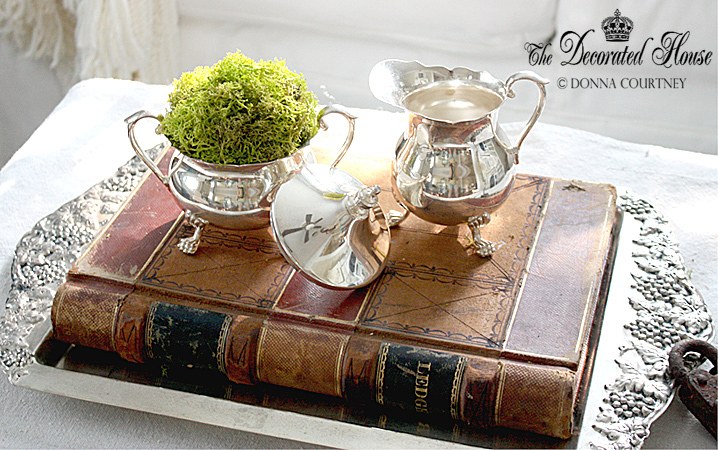 Your silvers and the book are GORGEOUS! Look so classy and vintage! This is such a smart idea! I love that you not only made a slipcover, but a runner for easy clean up. It's just perfect for the spot. 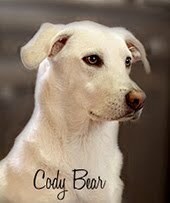 thanks so much for linking up the inspiration! !